Well, we know it’s getting closer when the sign goes up at the theatre! The new digital marquee at The Olde Walkerville is great, and it’s fun to see notice of our show make its appearance! I had to pull over this morning on the way to work to get a good shot. Surprisingly, I still run into people who don’t know Seussical, and want to know what it’s all about. So I just thought I’d make a wee post about that for anyone who’s not sure. If you take a bunch of your favourite Dr. Seuss books and stir them together, you find your story. Here we have the story of the Cat in the Hat encouraging young Jojo the Who, son of the Mayor and his wife, to use his imagination. In the meantime, we have Horton the Elephant, hearing the Whos in the speck of dust on the clover, and all of his “friends” mocking him. We have him abandoned to babysit an egg for lazy Mayzie LaBird, and Gertrude McFuzz pining for him, and figuring out she doesn’t need to be anyone but the wonderful bird that she is to gain his appreciation. We have appearances by many other beloved characters, including the Grinch. And it’s all stirred together with fantastic music and dance, and perfect for you and your family to enjoy. This production will be performed by our entire company, nearly sixty kids, ages 6-18. We’re only 10 days away from moving into the theatre, and we can’t wait to get started with our audiences. Our school performance on the morning of Friday, May 25th, sold out very quickly, but we have three performances that we can’t wait to present for general audiences. Tickets are available through the Olde Walkerville Box Office (in person and online), through Eventbrite.com, and at the theatre one hour before each show! They’re also available from any cast member! Riverfront likes to end our season each year with a family-friendly musical. 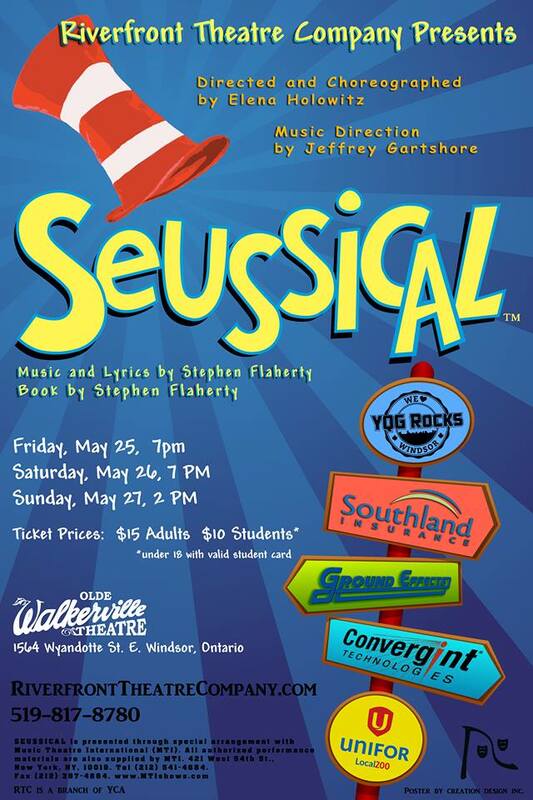 We’re proud to bring Seussical to the stage this year, and we hope that you will be joining us! 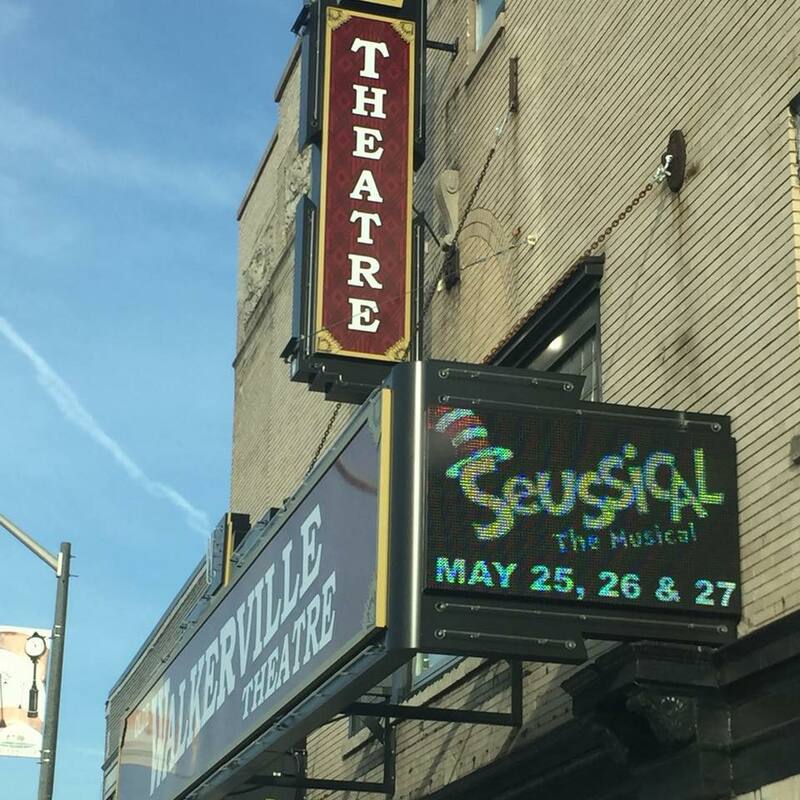 Previous: Previous post: Our May 2019 Musical Will Be…..
Next: Next post: Horton Invites You to Come See Seussical!